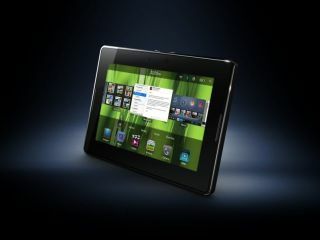 RIM's new iPad competitor, the BlackBerry PlayBook, has been shown off again in a detailed video to highlight some of its high end features. At a network event in Canada, the new device was put through its pace for a few minutes, highlighting a few things users can expect. The first was two styles of gestures - the normal way of flipping through screens, and then using the frame, so pulling down from the top will open up controls, much like the Android way of seeing notifications. Video also featured prominently in the walkthrough, with the 1080p capabilities on show and working smoothly, despite the early build. The RIM spokesperson said: "We wanted to make sure devices like this are a true crossover, moving away from merely messaging and into a combination of media, internet and more." The video even continued playing as the internet was brought to the foreground, and also when dropping out to view the multi-tasked apps in thumbnail, which seems pretty impressive. Sadly the browser isn't fully up to speed, not harnessing the dual core power of the PlayBook, but we should see more as the Q1 2011 release date (for the US at least) draws ever nearer.